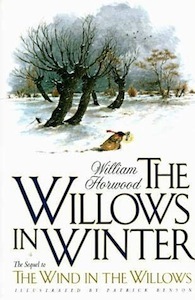 In the forest of The Willows in Winter by William Horwood, the animal residents attempt to bring tranquility from the crazed events that come. Mole, a resident of the Wild Wood, lives in Mole End, with his nephew who came for a visit during winter. With his uncomfortableness, Mole tries to accept his nephew, but prefers his time by himself. A surprise visit from Portly, Otter’s son, from the snowstorm outside causes Mole to jump to conclusions, and he ends up getting lost in the blizzard. Mole’s nephew, Portly, Water Rat, Otter, and Badger attempt to find Mole, but his whereabouts were still unknown. The last hope resounds with a ride from Frog’s outlawed plane, but Rat had been ejected and Frog rode away in the plane for his own pleasure. The animals decide that Mole is gone, and a funeral would be held. During his funeral, Mole appears as a ghostly figure, his trek to the Wild Wood unknown. After being astonished, the animals quickly provided help. While Mole is crippled by his adventure through the river, Water Rat is in much more stress. Believing that he had seen Beyond, Rat becomes less outward with his emotions while Mole begins to burst with the details of his journey. The Wild Wood returns to normal again, but not everything is calm, and Frog is missing. The overall content of the book was excellent, and I found myself reading the book multiple times from the cover to the back. Although the residents of the Wild Wood are animals, they show striking similarities to people. The book has a strong vocabulary and great word choice, as it makes the reading more enjoyable and engaging. I could feel the atmosphere of the rooms by reading the conversations of the animals. However, a weakness of the book is that it has a childlike feeling, although the book has advanced vocabulary. I would recommend this book for middle schoolers due to its high reading level. William Horwood, the author of this book, wrote this book from the original The Wind in the Willows, and brought back the dispositions of Mole, Water Rat, and many of the other critters. The story has a compelling plot that was quite long, but made to feel sweet and short. If I could give a rating for this book, it would be nine-and-a-half out of ten stars. 1. Why is Mole so grumpy? 2. What did Mole write on the root of the willow tree? 3. Who made Mole jump to the conclusion that Otter was in trouble? 4. Why did frog tell the pilot to restrain from landing his plane? 5. Why did Frog go on the pilot seat when Rat came on the plane? 6. Why did Toad crash his plane? 7. Why does Toad not want to leave his room? 8. Why is Rat acting strange to Mole? 9. What did Mole and Rat see that had appeared at different times? 10. What is the reason for Badger’s grumpiness? 11. How did Toad become imprisoned in the wedding? 12. Why did Badger give the untrustworthy stoat an invitation to tea? 13. Why did Toad refuse help for his trial? 14. Who provided the witness for Toad’s innocence? 15. Why did Toad allow for his house to burn?